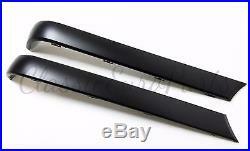 A set of brand new, OEM BMW, Euro E30 rear bumper trim. Deletes the side marker holes in your US E30. Fits any late model E30 with plastic bumpers! All packages sent to Europe are sent with Priority as a standard free of charge. This is a custom order part! It might take up to 2 weeks for it to be dispatched due to the parts coming from BMW Germany warehouse. Please contact me for exact times and stock. No return package will be accepted without our approval. Please check the parts condition when the package is delivered to your door. Act immediately to refuse package. We are not working on weekends or holidays. We might not be able to reply to your message during these days. The item "BMW E30 EURO REAR BUMPER TRIM Molding late model NFL plastic left + right 325 i" is in sale since Friday, November 25, 2016. This item is in the category "eBay Motors\Parts & Accessories\Car & Truck Parts\Exterior\Mouldings & Trim". The seller is "classiceuroparts" and is located in Kosice. This item can be shipped worldwide.